After decades of artifice, Israelis and people around the world yesterday finally got to see the real Shimon Peres. With a straight face and a dour demeanor, Peres intoned about the need “to put country before party”, thereby seeking to explain his dramatic decision to leave the Labor Party and back Ariel Sharon for Prime Minister. But those words are merely an empty facade, a transparent ruse that no one can take seriously. And here is why: it was just two weeks ago that Peres sought to be elected Chairman of Labor, and its candidate for Prime Minister, in the party’s primaries. In other words – had Peres won that vote, rather than enduring an embarrassing defeat to Amir Peretz – he would now be running against Sharon in the upcoming election. But because he lost, and Peretz refused to guarantee him a safe slot on Labor’s Knesset list, Peres was left with no choice but to cut and bolt, throwing his support behind Sharon in the hopes of salvaging his own political future. So, you see, it has everything to do with power, and very little, in fact, to do with principle. “Country before party”? Hardly. 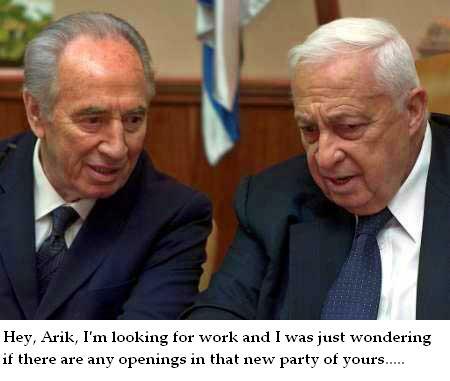 It was more like “Peres before party”. And that, at the end of the day, is what the real Shimon Peres is truly all about.